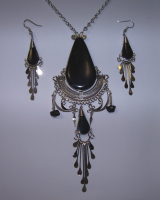 This western style necklace is from metal with a center black stone. The necklace is 17 - 20 inches adjustable. Earrings are fish wire hooks and are 1 inch long. Perfect with any casual outfit like a pair of denim jeans! 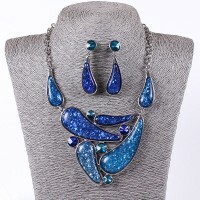 Unusual abstract necklace set is made from 18K White Gold plated Alloy with enamel, resin and rhinestones. The chain length is 16 inches - 20 inches. The earrings are: 3/4 x 3/4 inches. Makes a real statement! 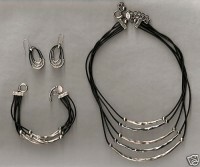 Black cat's eye necklace, bracelet and earrings set. It is made with alpaca silver, which is an alloy of zinc, copper, iron and nickel. It is extremely lightweight and will not rust or tarnish. The center pendant hangs down around 4 inches.The necklace was handmade in Peru. The chain is approx. 20 inches in length. Gorgeous and very unusual! Black and clear faceted lucite framed by black geometric squares. 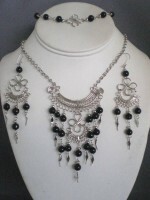 Necklace is 16-1/2 - 19/12 inches adjustable. Earrings are 3/4 inches long. Beautiful! Beautiful black and silvertone half moon 3 inch pendant with varied length black dangles is 18 - 21 inches long. Earring are 2 inches long. 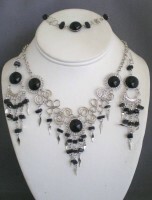 This stunning, silvertone, lead and nickle free statement necklace set is made with black acrylic and clear crystal beads attached to a black rope cord. The necklace is adjustable from 18 - 21 inches. The center of the pendant is 4 inches long. Earrings are 1 inch black bead with clear crystal teardrop (not shown.) Will accent an outfit beautifully! 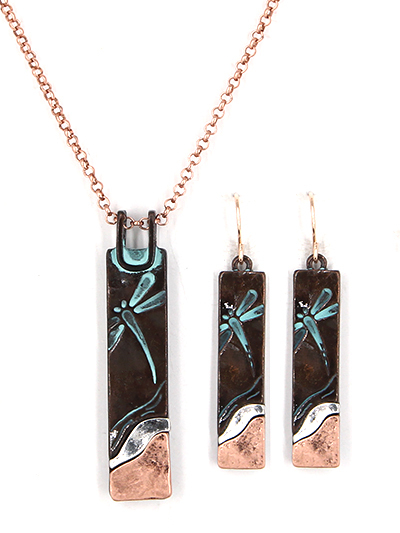 This gorgeous dragonfly set has, black, teal, silver and rose gold tones. The pendant is 1-3/4 inches long and the chain adjusts to 18 inches. The earrings are 1-1/4 inches long. You'll love it! 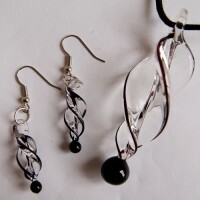 This stunning set is made of black,smoke and clear acrylic stones. AIt comes with a 20 inch thin snake chain. The pendant is 2 inches. The earrings are 1 inch. Stunning iridescent black and gray resin beads with crystals in multi layers. Necklace center is 3-1/2 inches. Earrings are 2 inches long including posts. Looks great with neutrals. You will receive lots of compliments! White 18K Gold Chain Drop Shape Bib necklace is made from black and gray glass, crystal and enamel. The necklace is 16 inch + 3-1/2 inch extender. Post teardrop earrings are 1-1/4 inches long. Makes a beautiful statement! 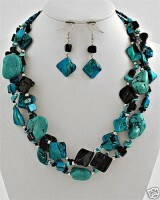 Black Peruvian murano glass and cascajo stone necklace, bracelet and earrings set. You will receive a set just like the one in the picture. It is set in alpaca silver which is an alloy of zinc, iron, nickel and copper. It is extremely lightweight and it will not rust or tarnish. The set was handmade in Peru. 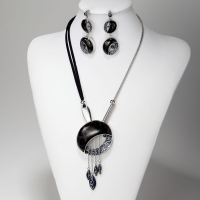 These is a black onyx set of beautiful necklace and earrings handmade in Peru.The necklace length between 18" - 19" (adjustable) and earrings are 2.5 inches long. . 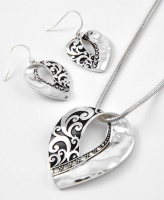 They are made in alpaca silver which is an alloy of zinc, nickel, iron and copper. It will not tarnish or rust and it is very lightweight. Would complement any outfit! 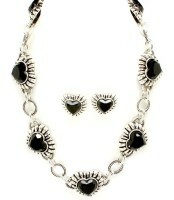 Elegant Chunky Black Silver Heart Cable Designer Look necklace set has black glass heart stones on silvertone with cable links between. Necklace is 18 inches + 3 inch extender. Earrings are 3/4 inch posts. Great with a little black dress or jeans! Gorgeous silvertone, lucite and epoxy black,brown, blue pendant is 2 inches long with blue rhinestone accents. Chain is 17 inches long with 3 inch extender. Earrings are 1 inch long. 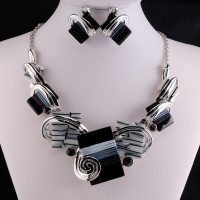 Clear and black murano glass necklace /earrings set. Necklace pendant size: approx. 2-1/2 inches long x 1 inch wide. Black 18 inch ribbon/cord with 2 inch extender necklace. Earring pendant size: approx. 3/4 inch. 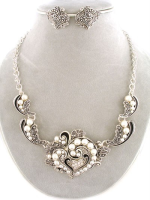 Chunky 2 inch wide heart and leaf metal necklace set with crystal and pearl accents. Necklace is 18 inches long + 3 inches extender and lobster claw clasp. . Post earrings are 3/4 inches. This set is lead and nickle free. Breathitaking! Black, white pearl and clear ab beads fashion this 18 inch adjustable necklace. The cluster drop is 3 inches. The 3/4 inch matching earrings are a clear ab bead with black bead below. Prettier than picture shown. 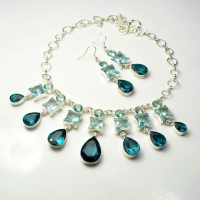 Blue aquamarine, faceted crystal necklace is 18 - 21 inches long. The center drop is 2 inches long and the other drops are 1-5/9's inches long. Earrings are 3/4's inches long. Stunning! 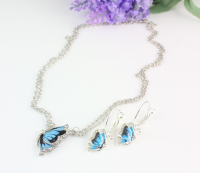 This two tone half butterfly pendant has clear rhinestones outlining its wings. The pendant is 1 inch long & 5/8 's wide. The chain is 16 inches with a 3 inch extender. The 3/4 inch silver hoop earrings have 1 1/2 inch two tone butterfly hanging.. Stunning! 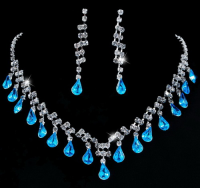 Clear rhinestone 16 - 18 inches necklace has a collar of blue crystal teardrops. Earrings are 1-1/2 inches long. 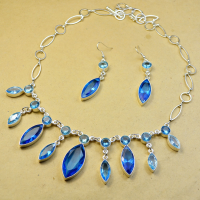 Two toned blue faceted crystal necklace is 18 - 21 inches long. The center drop is 2 inches long. Earrings are 3/4's inches long. Stunning! Austrian crystal necklace is 16 - 18 inches long. Earrings are 1 inch long. Elegant! 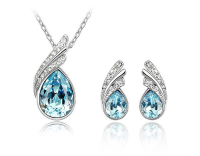 The delicate deep blue crystal teardrop has a side encrusted with clear rhinestone. The pendant is 1 inch long and the fine chain is 16 - 18 inches long. The post earrings are 1/2 inches. Stunning iridescent blue resin beads with royal blue crystals in multi layers. Necklace center is 3-1/2 inches. Earrings are 2 inches long including blue posts. Looks great with many shades of blue. You will receive lots of compliments! Two toned blue faceted crystal necklace is 18 - 21 inches long. The center drop is 1-1/2 inches long. Earrings are 3/4's inches long. Stunning! Bamboo style necklace set made with glass beads and crystal accents. The necklace is 16 - 19 1/2 inches adjustable. Earrings are 3/4 inches. Makes a statement! 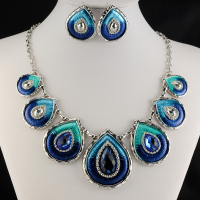 White 18K Gold Chain Drop Shape Blue Bib necklace is made from blue and teal glass, crystal and enamel. The necklace is 16 inch + 3-1/2 inch extender. Post teardrop earrings are 1-1/4 * 1 inches. Makes a beautiful statement!utiful statement! 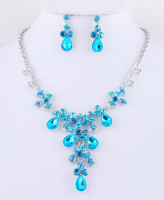 High Quality Clear Austrian Crystal Rhinestone, Silver Plated Metals with royal blue teardrop center. Necklace is 16 - 19 inches long. Earrings are 1-1/4 inches long. Perfect for any special occasion! Braided antique silver bar with crystal accents necklace is adjustable from 18 - 21 inches. Earrings are 1 inch long. Prettier than picture and very versatile! 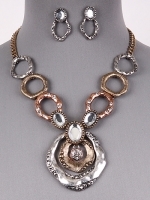 Clear Crystal metal statement necklace is 16 inches with 3 inch extender. Earrings are 1 inch long. Beautiful! 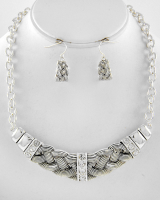 Clear Crystal and silver metal link comprises this necklace that is 16 inches long + 3 inch extender. Post Earrings are 1-1/2 inches long. White 18K Gold Chain Drop Shape Bib necklace is made from coffee and silver glass, crystal and enamel. The necklace is 16 inch + 3-1/2 inch extender. Post teardrop earrings are 1-1/4 inches. Makes a beautiful statement! 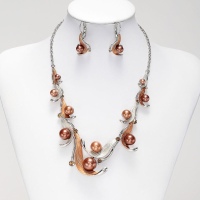 Coffee Crystal Leaf Motif with two tones of brown faux pearl necklace is 16 inches long with 3 inch extender. The lever back pierced earrings are 1-1/4 inches long. Stunning! 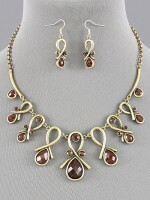 Gold Ribbon Metal Art Set has brown crystals surrounded in gold. The droplet pattern necklace is 17" long + 2" extender. Center pendant droplet is 1 3/4" Long. Earrings are 1 3/4" long. Gorgeous! 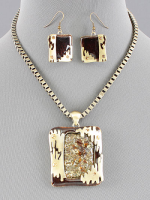 Gorgeous goldtone, lucite and epoxy brown pendant is 2 inches long with topaz rhinestone accents. Chain is 17 inches long with 3 inch extender. Earrings are 1 inch long. 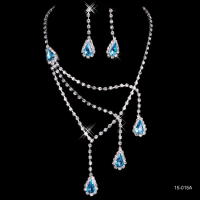 High Quality Austrian crystals adorn this necklace set. The butterfly pendant is 3.25 icnhes long. Necklace is 16 - 20 inches adjustable. 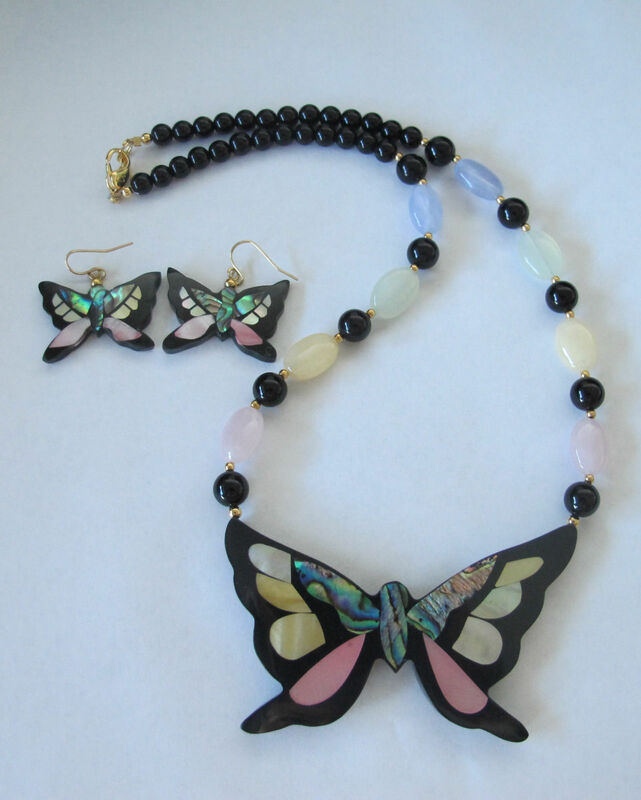 Half butterfly post pierced earrings are 2.75 inches long. Perfect for wedding or any special formal event! Crystal heart has crystals in one inch pendant and surrounding the inner heart. The necklace is 19 inches long. Earrings are 1 inch total. Stunning! Smoky Crystal & pewter metal links comprises this necklace that is 16 inches long + 3 inch extender. Post Earrings are 1-1/2 inches long. 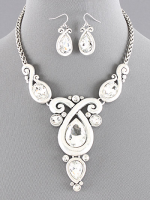 Austrian crystal necklace set is 16 - 18 inches long. Post Earrings are 1 inch. Classic and beautiful! 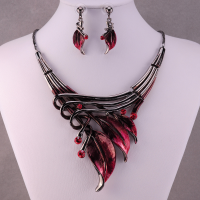 Very pretty vine designed set is made from hematite and hand painted dark red. The vine leaves have crystal accents. The necklace measures 18 - 21 inches. The drop in the design measures 4". The vine earrings measure 1 1/4". Perfect for any special occasion! 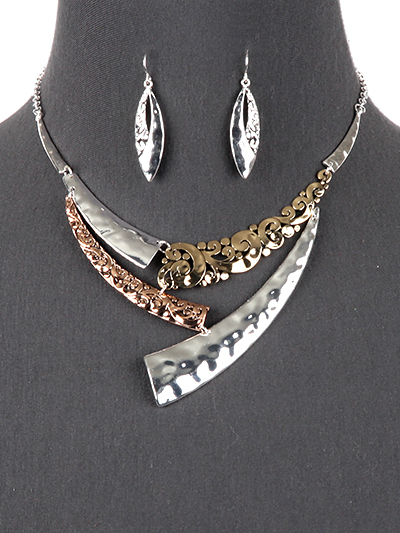 This abstract necklace is made of silver, gold and rose gold tones. The necklace adjusts to 18 inches. The hammered earrings are 1-1/2 inches long. Makes quite a statement! 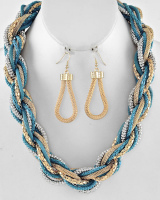 Chunky Bold Turquoise Silver & Gold Twisted Mesh Necklace is 21" Long with 3" Extender. Earrings are 2-1/2" long. 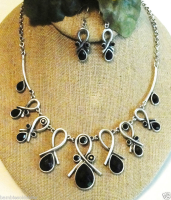 Very pretty vine designed set is made from hematite and hand painted gray. The vine leaves have crystal accents. The necklace measures 18 - 21 inches. The drop in the design measures 4". The vine earrings measure 1 1/4". Perfect for prom, wedding or any special occasion! 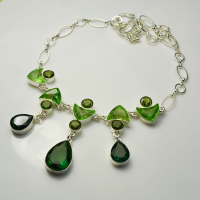 Two toned green faceted crystal necklace is 18 - 21 inches long. The center drop is 2 inches long. Leaf earrings are 3/4's inches long. Stunning! 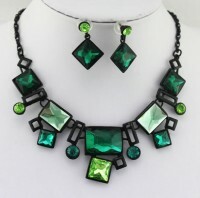 Two toned green, faceted crystal necklace is 18 - 21 inches long. The center drop is 2 inches long and the other drops are 1-5/9's inches long. Earrings are 3/4's inches long and match the style & length of the teardop. Stunning! LIme, kelly and teal green faceted lucite framed by black geometric squares. 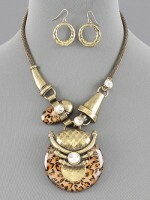 Necklace is 16-1/2 - 19/12 inches adjustable. Earrings are 3/4 inches long. Beautiful! 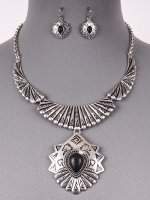 This half moon bib style necklace set has rhinestone accents on the 2-3/4 inch long and 3/4 inch high pendant. 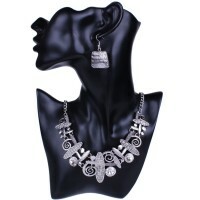 The necklace length is 17-1/2 - 21 inches adjustable. Earrings are 3/4 inches long. 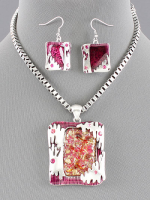 This abstract necklace set has a beautiful pink glass and silver wire pendant that is 3- 1/2 inches long.. The chain is adjustable from 16 - 20 inches. Earrings are 1 inch long. Gorgeous! This beautiful silvertone hot pink multi shaped bib set has light pink rhinestone accents. Necklace is 16 inches + 3 inch extender. Earrings are 1 inch long. 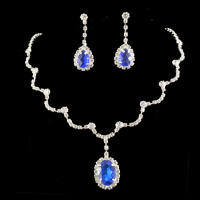 Large lapis lazuli semi-precious stone and alpaca silver medallion necklace, bracelet and earring set. It is made with alpaca silver, which is an alloy of zinc, copper, iron and nickel. It is extremely lightweight and will not rust or tarnish. The set was handmade in Peru. The necklace is approx. 17" with the pendant dropping down about 5". The bracelet is approx. 8 1/2" and the earrings are approx. 3" long including the earwire. The earrings are for pierced ears. LargeTurquoise and cascajo stone necklace. It is made with alpaca silver, which is an alloy of zinc, copper, iron and nickel. It is extremely lightweight and will not rust or tarnish. The center pendant hangs down around 4 inches.The necklace was handmade in Peru. The chain is approx. 20 inches in length. Gorgeous and very unusual! Beautiful, vintage mother of pearl Shell Inlaid Flower necklace is 20 1/8" long. The pendant is 2 3/8" in size. The pierced earrings are 1 1/8". 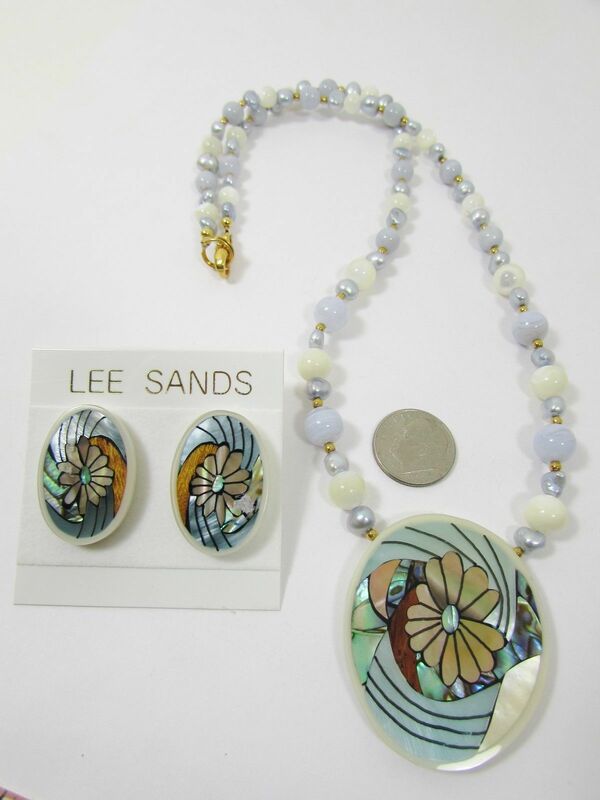 This new old stock set was made in the 1980's by Lee Sands, a Hawaiian artist. Includes a Lee Sands gift box. Enhances any outfit! This vintage Mother of Pearl, Purple Oyster amd Wood/Brownlip Inlaid Owl is new old stock from 1980's signed by Lee Sands, a Hawaiian designer. Owl pendant is 1 -7/8" long . Necklace is 21 -1/4 inches strung with Amber, Citrine and Cultured Freshwater Baroque Pearls.Earrings at 1- 7/16 " long. Includes a Lee Sands gift box. Stunning! 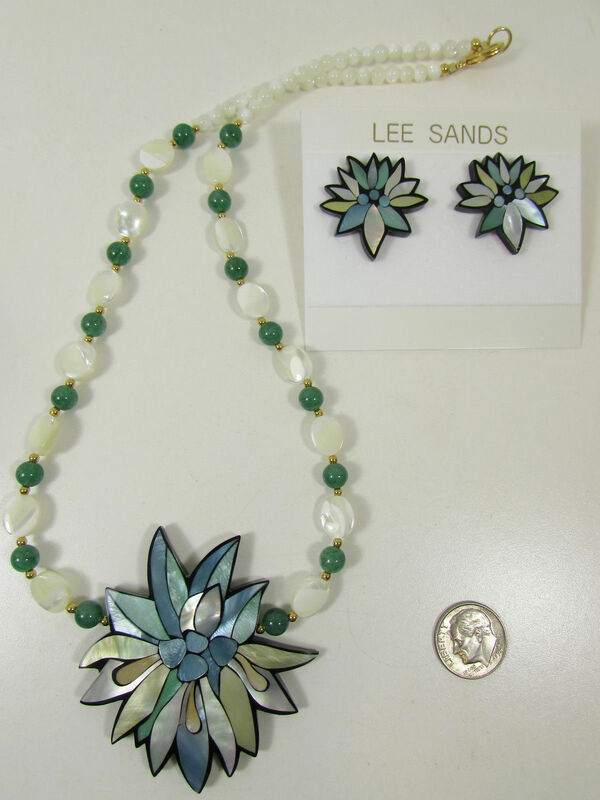 This vintage unsigned Lee Sands Shell Inlaid Flowers of necklace & earrings is prettier than photo. This 1980's necklace is 20 3/8" strung with Pastel Blue Cultured Freshwater Pearls, Mother of Pearl beads and Blue lace agate. The pendant is 1-1/2 inches in diameter and is made from mother of pearl and abalone shell. The 3/4 inch earrings are 1/2 inch in diameter. Very colorful, elegant set! This 1970's Charming and fluttery butterfly, encased in dyed Mother of Pearl of pink, yellow, cream and abalone, matches with a similar shades of lentil Rose Quartz, Yellow Quartzite, Prehinte and Lacy Agate, and round glass. Necklace is 19 " long; pendant is 2 " high x 3: wide. Earrings are 1-1/4 " h x 1-1/4 " w. Cheerful and attractive, it will brighten up your day as well as your outfit. 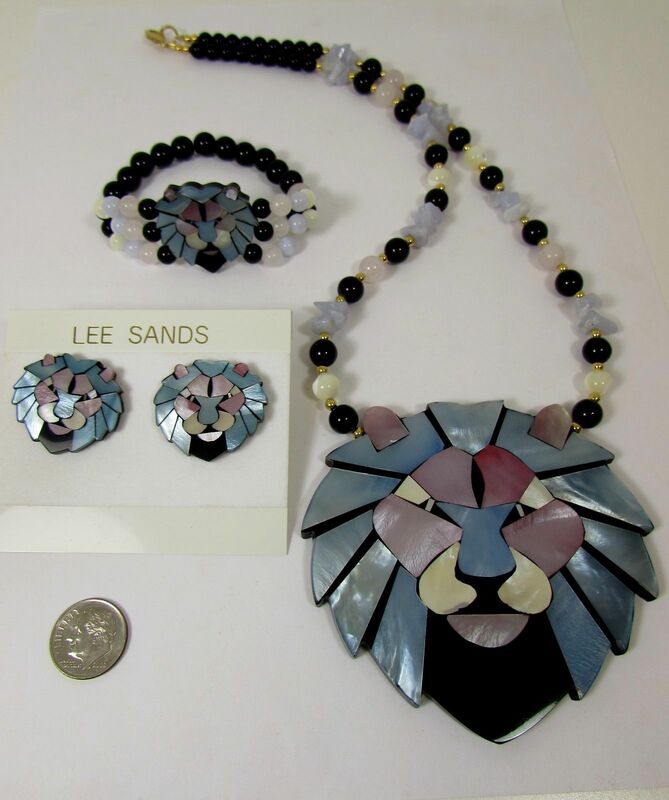 This set is made by Lee Sands, an Hawaiian artist, in the 1980's. The lion's face is shades of blue and pink abalone. The beads are rose quartz, blue lace agate, mother of pearl and black beads . The necklace is 22 1/4" long and the lion pendant is 3 1/4" diameter. The stretch bracelet fits a small wrist of 6 1/2 ". Prettier in person! Beautiful Leopard Pendant is 2-3/4 inches long on a mesh adjustable 16 - 19 inch chain. Crystal accents adorn the neckace. Hammered hoop earrrings match the hammered metal on pendant and are 1-1/4 inches long. Unusual! 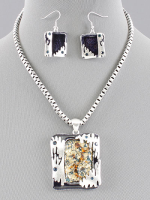 Abstract design silver plated necklace set is made from purple acrylic swirl stone and multicolor epoxy coloring . The necklace is adjustable to 20 inches long . The pendant part measures 2 3/8 inch long by 2 inch wide . The earrings measure 1 1/2 inches long . Makes a real statement! 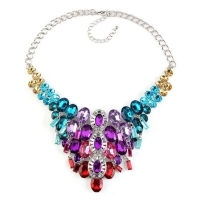 Multi colored crystal bib necklace is 16 - 19 inches adjustable. Center is 3-1/2 inches long. Earrings (not shown) are 3/4 inches teal teardrops. Gorgeous! 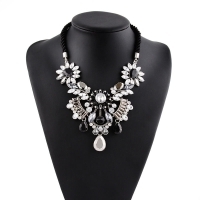 This statement necklace is made of 3 multi shapes with a smoke, black & clear stones. 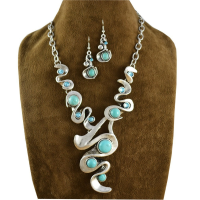 The necklace adjusts up to 18 inches and the earrings are 3/4 inches long. Perfect with any outfit! Two toned peacock green faceted crystal necklace is 18 - 21 inches long. The center drop is 2 inches long and the other drops are 1-5/9's inches long. Earrings are 3/4's inches long. Stunning! This 1980's set Is brand new, therefore in great vintage condition. It still has the original card on it.The big pink heart pendant is made of ceramic and has two flowers on it with a glazed finish; the large pendant measures approx 3” long X 3 ¾” wide. The necklace is strung with four rows of small silver-tone beads strand that connects to silver-tone disk shape beads. and faux pearls. 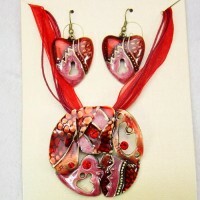 It comes with matching pink heart ceramic pierced earrings with one flower in the center. The earrings are approx 2 ½” long X almost 2” wide.. 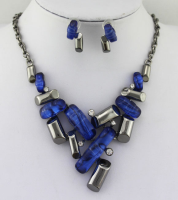 The necklace measures approx 21” long and has a barrel, screw type clasp for closure. Breathtaking! Just keep in mind that this piece is over 35 years old. 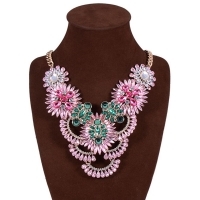 Two tones of pink and clear crystal bib necklace is 16 - 19 inches adjustable. Center is 3-1/2 inches long. Earrings (not shown) are 3/4 inches pink teardrops. Gorgeous! 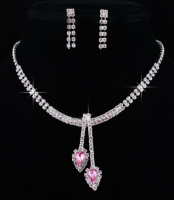 Clear rhinestone 16 - 18 inches necklace has a collar of pink crystal teardrops. Earrings are 1-1/2 inches long. 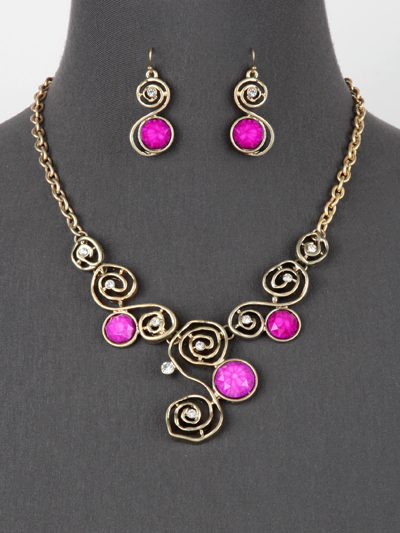 Very pretty vine designed set is made from hematite and hand painted pink tones. The vine leaves have crystal accents. The necklace measures 18 - 21 inches. The drop in the design measures 4". The vine earrings measure 1 1/4". Perfect for any special occasion! This lipstick pendant is made with pink lucite and one clear rhinestone. The ball chain is 23 inches long. The pendant is 1-1/4 inches long x 1-1/2 inches high. Comes with a pair of rmatching pink lip studs that are 5/8 inch. Great way to advertise your business or for just fun! Pink quartz natural stone necklace, bracelet and earrings set. The set was handmade in Peru. It is made with alpaca silver which is an alloy of zinc, iron, copper and nickel. It is extremely lightweight and will not rust or tarnish. 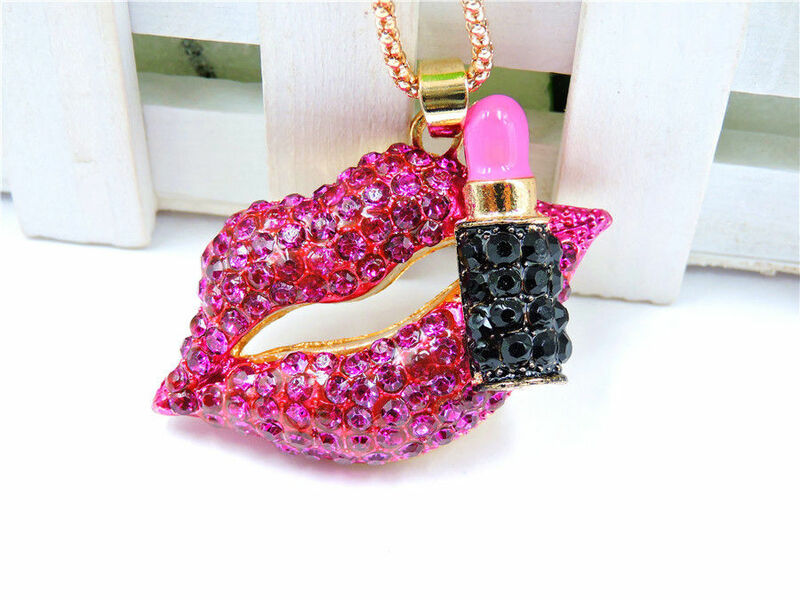 This gold plated Betsey Johnson lipstick pendant is made with pink and black rhinestones. The chain is 27-1/2 inches long. The pendant is 2-1/4 inches x 1-3/4 inches. Comes with a pair of pink rhinestone lip studs that are 5/8 inch. Perfect for someone in the makeup industry to advertise their business or for just fun! 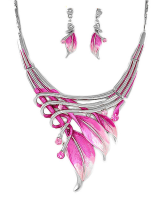 Silvertone leaf necklace is made of pink and clear crystals. It is adjustable from 19-1/2 inches - 21-1/2 inches. Earrings are 1-1/2 inches long with 2 shades of pink beads in a fan shape. Breathtaking! Gorgeous silvertone, lucite and epoxy pink pendant is 2 inches long with pink rhinestone accents. Chain is 17 inches long with 3 inch extender. Earrings are 1 inch long. This beautiful necklace is made with 2 shades of pink, clear and teal crystals. It is 18 - 21 inches long. The pendant is 4-1/4 inches at the longest point in the center.One inch long earrings are made with round pink and clear glass teardrop beads (not shown). Stunning! 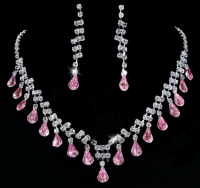 Clear rhinestone necklace is 16-18 inches long with pink teardrops. The teardrops are 1-1/2 inches long. Earrings are 1 inch long. 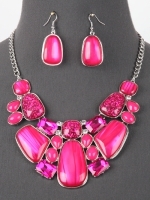 Gorgeous hot pink, black and clear crystals adorn this 16 - 19 inch adjustable necklace. Earrings are 1-1/2 inches long. Stunning! 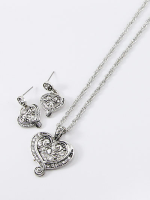 Beautiful filigree heart set is studded with crystals. Necklace is 2 inches x 2 inches and the earrings are 3/4 inches long. Chain is 16 inches with a 2-1/2 inch extender. Goes with anything you wear! 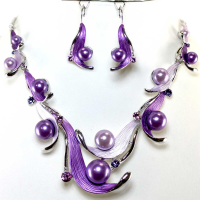 Crystal Leaf Motif with two tones of purple faux pearl necklace is 16 inches long with 3 inch extender. The lever back pierced earrings are 1-1/4 inches long. Stunning! 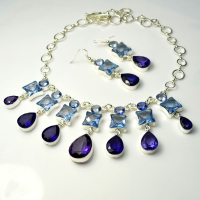 Purple and blue aquamarine, faceted crystal necklace is 18 - 21 inches long. The center drop is 2 inches long and the other drops are 1-5/9's inches long. Earrings are 3/4's inches long. Stunning! 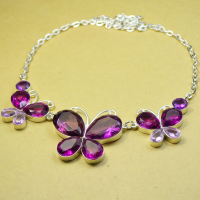 Two toned purple, faceted crystal butterfly necklace has center 1-1/2 inches butterfly. This necklace is 19 - 21-1/2 inches long. Matching butterfly 3/4 inch earrings (not shown) are also red rose/lavender artificial gems. Please email me at uniquelyujewelry@hotmail.com if you would like to see the pierced earrings. Enhances any outfit! 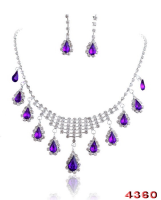 Clear rhinestone 16 - 19 inch necklace has a collar of purple crystal teardoprs surrounded with clear rhinestones. Earrings are 1 inch long. 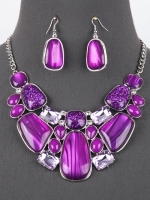 Beautiful purple stone bib necklace with clear rhinestone accents is 18 inches long. The earrings are 1-1/4 in lengrth. Enhances any outfit! 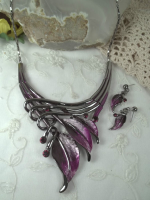 Very pretty vine designed set is hematite and hand painted purple. The vine leaves have blue crystal accents. The necklace measures 18 - 21 inches. The drop in the design measures 4". The vine earrings measure 1 1/4". Perfect for prom, wedding or any special occasion! This beautiful silvertone purple multi shaped bib set has light lavender rhinestone accents. Necklace is 16 inches + 3 inch extender. Earrings are 1 inch long. White 18K Gold Chain Drop Shape Purple Bib necklace is made from purple and raspberryl glass, crystal and enamel. The necklace is 16 inch + 3-1/2 inch extender. Post teardrop earrings are 1-1/4 * 1 inches. Makes a beautiful statement! This gorgeous coppertone pendant is 2-3/8's inches diameter and has lucite red stones. The chain is 18 - 21 inches long. The earrings are 1-1/4 inches long. 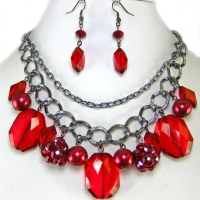 Two toned red faceted crystal necklace is 18 - 21 inches long. The center drop is 1-1/2 inches long. Earrings are 3/4's inches long. Stunning! Silvertone 2 inch pendant has a red howlite center and come with the necklace wire. 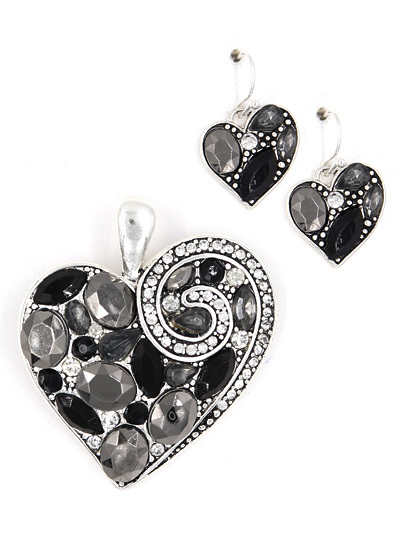 Heart earrings are 1-1/4 inches long. This gorgeous hematite tone necklace has red faceted lucite and faux pearl beads hanging from the bottom strand. The length is 16 - 19 inches adjustable. The center drop measures 2-1/4 inches for the beads. Matching earrings are 1-1/2 inches long. Gold tone 2 inch round red and pink pendant accented with red rhinestones and 1 inch heart pierced earrings; leather cord is 17 inches. 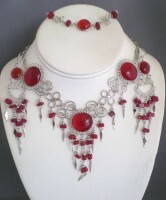 Red faceted crystal necklace is 18 - 21 inches long. The center drop is 2 inches long and the other drops are 1-5/9's inches long. Earrings are 3/4's inches long. Stunning! This gold plated Betsey Johnson lipstick pendant is made with red and black rhinestones. The chain is 27-1/2 inches long. The pendant is 2-1/4 inches x 1-3/4 inches. Comes with a pair of red rhinestone lip studs that are 5/8 inch. Perfect for someone in the makeup industry to advertise their business or for just fun! 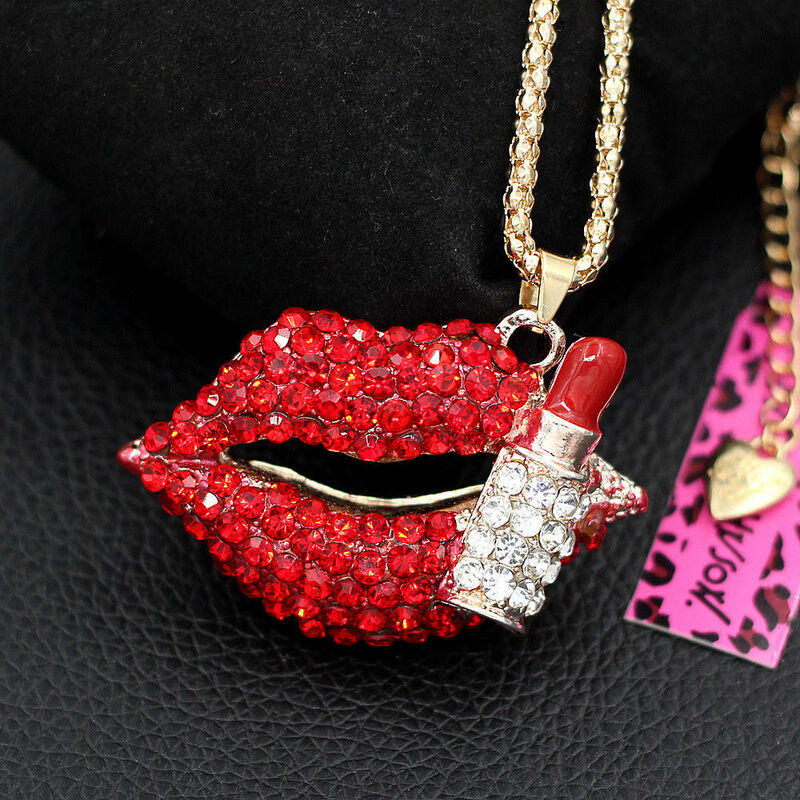 This gold plated Betsey Johnson lipstick pendant is made with red and white rhinestones. The chain is 27-1/2 inches long. The pendant is 2-1/4 inches x 1-3/4 inches. Comes with a pair of red rhinestone lip studs that are 5/8 inch. Perfect for someone in the makeup industry to advertise their business or for just fun! 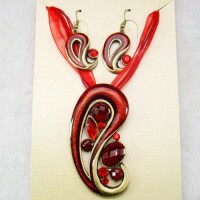 Gold tone red lucite and crystal stones in a 3 inch drop swirl design. The red ribbon/cord is 17 inches long. The earrings are 1-1/2 inches long. Stunning! 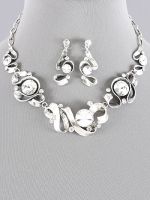 Beautiful rhinestone tie set has a 4 inch rhinestone pendant. The necklace is adjustable from 18 inch - 21 inches. The earrings are 2 inches long. 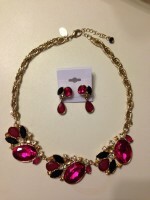 Fun set to wear for any occasion! Fashion rose red two tone, faceted crystal flower pendant is 1-5/8 inches at the center. The necklace is 19 - 21-1/2 inches long. 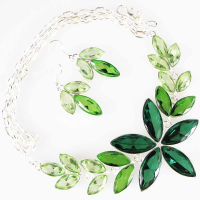 Matching leaf 3/4 inch earrings are also pink artifical gems. Enhances any outfit! Silvertone Shell design 2-1/2 inch pendant has an abalone center. The necklace is 17 inches long with a 3 inch extender. The earrings are 1 inch.long. 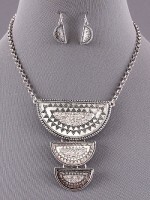 Antique Silver style with clear rhinestone accents on 16 - 19 inches bib necklace. Earrings are 1-1/4 inches long. Great statement piece for any outfit! 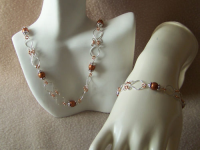 Hand crafted hammered U link wire and copper beads set -- 18 inch necklace with extendier, 7 inch bracelet and 1/2 inch earrings. Versatile, delicate and showy! 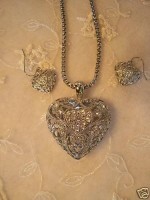 Silver hearts are half filigree and half hammered silvertone with rhinestone accents. The pendant is 2 inches long entwined on an adjustable snake chain that is 16 - 19 inches long. The drop earrings are 1-1/2 inches long. Gorgeous! 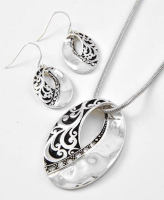 Silver ovals are half filigree and half hammered silvertone with rhinestone accents. The pendant is 2 inches long entwined on an adjustable snake chain that is 16 - 19 inches long. The drop earrings are 1-1/2 inches long. Gorgeous! Hammered leaf pendant is 2 inches long on a 16 - 19 inch adjustable chain. Matching earrings that are 1-1/2 inches long. 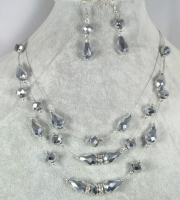 Multi Strand Silver & Faceted metallic gray beads with crystal accents illusion set. The first strand measures 17", each consecutive strand is a little longer, It has s a 2" extender. The earrings measure about 1 1/4". 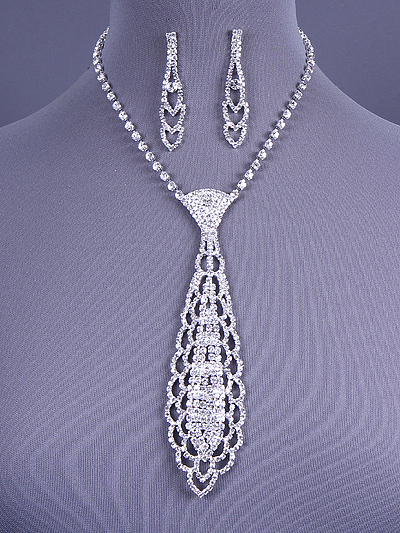 Beautiful silverstone metal set has clear rhinestones and is adustable with an 18 -inch lengrh with 3 inch extender. . Post earrings are 1-1/4 inches long. Very versatile! Silvertone Ribbon Metal Art Set has black crystals surrounded with silver. The droplet pattern necklace is 17" long + 2" extender. Center pendant droplet is 1 3/4" Long. Earrings are 1 3/4" long. Gorgeous! Beautiful medallion is 2 inch square with pattern and crystal rhinestone in center. Necklace chain is adjustable from 18 -21 inches. Earrings are 1 inch long. Enhances any outfit! 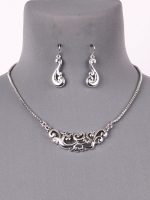 Delicate silverstone metal set is adjustable with a 16 inch chain and 3 inch extender. Post earrings are 1-1/2 inches long. Elegant! 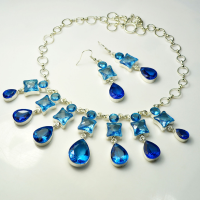 Gorgeous austrain crystals surround blue teardrop crystals. Necklace is 17 - 20 inches as it is adjustable. Earrings are 1-1/4 inches long. This side design makes a great statement! 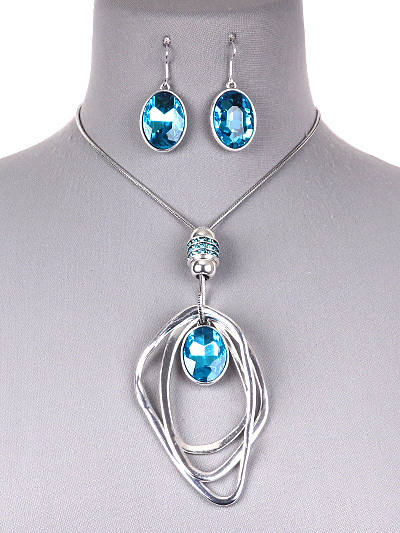 This abstract necklace set has a beautiful teal glass and silver wire pendant that is 3- 1/2 inches long.. The chain is adjustable from 16 - 20 inches. Earrings are 1 inch long. Gorgeous! 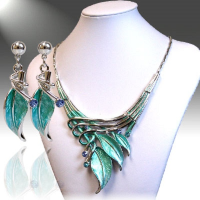 This beautiful vine designed necklace set is made of Aquamarine blue and light Sapphire colored Genuine Austrian Crystals in a hematite setting and hand painted teal. 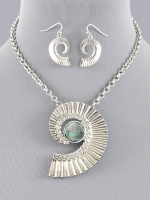 The necklace measures 18" long to an adjustable 21" approx with the drop of 4 inches. 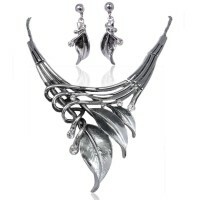 The leaf earrings are for pierced ears and measure 1/2"W x 1 1/2"L . Very Elegant! 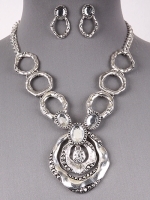 Pewter and crystal necklace is handpainted and 16 - 18 inches adjustable. The earrings are a inch drop. Beautiful! Teal epoxy 2 inch square pendant is on multi black 17 inch cord necklace with 3.5 inch extender (not silver chain as shown). Earrings are 1 inch in length. 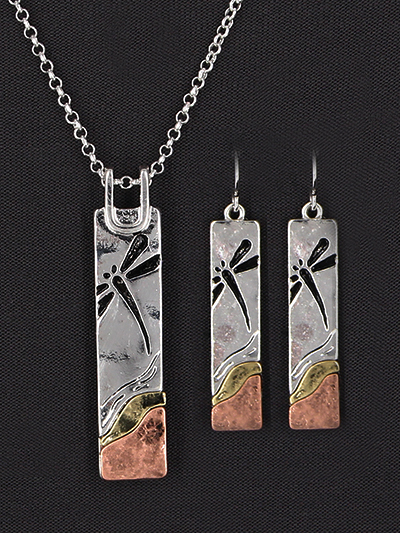 This gorgeous dragonfly set has silver, gold and rose gold tones. The pendant is 1-3/4 inches long and the chain adjusts to 18 inches. The earrings are 1-1/4 inches long. You'll love it! 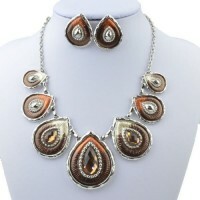 Vintage styleof burnished gold, copper and silver tones with crystal accents. Necklace is adjustable from 16 - 19 inches. The earrings are 1 inch round of burnished gold and copper with crystal center. Picture does not do it justice. Great statement piece! Gorgeous Necklace! Tri tones of silver, gold & copper on black multi cord 18" Long necklace with 2" extender. Silver 1" pierced earrings included. 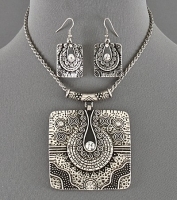 Beautiful tri tone metal set has clear rhinestones and is adustable with an 18 -inch lengrh with 3 inch extender. . Post earrings are 1-1/4 inches long. Very versatile! 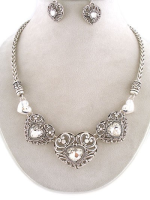 Triple open filigree hearts with rhinestone heart center necklace is 17 - 20 inches long. Earrings are 3/4 inches long. Stunning! Turquoise stone and teal rhinestone crystals adorn this silver 22 inch necklace. Pendant is 2-1/2 inches long. Each side is 2-3/8's inches. Also lead free. Earrings are 1-1/2 inches long. A real showstopper! Triple strand black and teal abalone shell with chunks of turquoise in an adjustable 17" - 21" necklace with matching earrings. Beautiful! 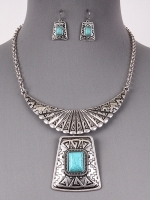 This western style necklace is from metal with a center turquoise stone. The necklace is 17 - 20 inches adjustable. Earrings are fish wire hooks and are 1 inch long. Perfect with any casual outfit like a pair of denim jeans!